Well, let’s face it, we have had enough rainy days recently in the UK. I certainly don’t have to water the garden or the vegetables. I’ve sorted and dusted and tidied up the house. Now it’s 3.30 pm, and the sky has turned threatening and heavy and grey – not more thunder and lighting? So I decided to turn on my computer and have a quick look at Twitter (where I am known as @astridsharing). In a matter of minutes I found some amazingly nice foodie people, who either produce, sell or write about food that looked and sounded so good it made my mouth water. So, seeing as it’s still horrible weather, I though I would cheer us all up and share my finds with you. The first one I came across it Great Glen Game – ‘Charcuterie with a difference, made with Wild Venison, sustainably sourced from the Great Glens of Scotland’. On Twitter – @greatglengame – is a Dutch lady, Anja Baak, who promotes their awardwinning Wild Venison Charcuterie which includes Salamis, Peperoni, Chorizo, Bresaola and Smoked Venison, whilst at the same time renovationg their old house and gardens in the Scottish Highlands. Being a lover of Charcuterie, particularly Bresaola, I was intrigued, and because Great Glen Game are updating their website, I followed their link to British Fine Foods. Now I’m having a lovely day, despite the rainy day. And what a site! A fabulous ‘Deli’, plus Fish Shop and a Butchers and a Drinks and Hamper section. Obviously the first department I clicked on was ‘Deli & Charcuterie’ – and what an amazing selection of food products to choose from, including the brilliant produce of Great Glen Game. 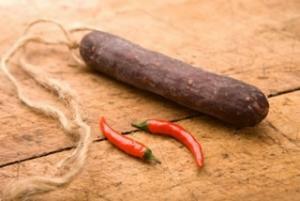 First, Venison Chorizo. This comes with a Recipe Suggestion of “White Bean Soup with Scallops & Venison Chorizo”. Click on the British Fine Foods site to find the recipe – it sounds delicious. Next came the one I long to try – Venison Bresaola. Imagine this on your plate, sprinkled with Wild Rocket, curls of salty Parmesan cheese on top and drizzled with fruity Extra Virgin Olive Oil (such as the Mother’s Garden Olive Oil I recently discovered), and a sliced gherkin or olives on the side. Maybe a bit of crusty bread to mop up the juices. Am I making your mouth water? Mine is. All the better if you’re in Italy, but in a dark, dank East Yorkshire, I could just relish it right now. Then I came across this Sliced Wild Boar Salami with Red Wine. I could almost smell the aroma off the page. It is finely sliced, and has won a 3* Gold at the Great Taste Awards, and is much loved in Michelin-starred restaurants. It just looks so full of flavour that I am going to have to order some for Erik and myself to share. There is just so much in this Charcuterie section, see for yourself. Chilli Venison Chorizo, Highland Caber Venison Salami with Green Peppers, Mustard Seed Venison Salami from Great Glen Game, New Season Smoked Grouse from Great Glen Game (busy people), The Gourmet Charcuterie Selection and much more. Then I thought “What about the Pates? Just a quick look,” (as we are going to the Theatre tonight, so I have to smarten myself up). There are so many Pates, again have a look, but I just came across this one that I fancied. Well, that’s sold it to me. Sounds so tasty. Must have some. I am going to spend time exploring the British Fine Foods website over the next few weeks. It looks a remarkable food site and is so enjoyable to while away an hour or two, and then choose some special treats. And I’ve run out of time, so I will keep the other foodie sites I’ve found, and put them on soon. So, What to do on a Rainy Day? I’ve enjoyed writing this, hope you’ve enjoyed reading it, and I’ve made your mouth water. Garlic Disaster – It’s gone Rusty! But Asparagus Success! Tomato Tart Recipe – what a tart! !